Many people consider Skyrim to be the best video game of 2011, and arguably the best role-playing game of all time too. This makes sense considering that Bethesda’s game offers a ton of quests in its enormous fantasy world, and hundreds of hours of gameplay to boot too. And few would argue that Skyrim (the chilly, northern province in which the game is set) is one of the most detailed worlds yet seen on a TV or computer screen. Also, the fact that you have so many ways to develop your character and can therefore sink so many hours into the game means there are still plenty of people playing Skyrim to this day, even on more recent gaming devices like the Nintendo Switch too. One thing that has added to Skyrim’s appeal and improved its replayability is the fact that tons of user modifications (mods for short) have been released over the years for Bethesda’s game. Some of these are merely cosmetic, making the game look prettier overall, while others add new quests and characters. Some, though, add entire new regions for you to explore such as the much celebrated Falskaar mod. There are also a few bizarre mods available for the game too, for those looking to try something out of the ordinary and enjoy a different experience to that offered by the main game. There is one mod currently in the works, though, which offers something that Elder Scrolls fans have been dreaming about for some time now – being able to explore the entire continent of Tamriel in one game. This is because each Elder Scrolls game since 2002 has only let players explore one of Tamriel’s provinces, such as Morrowind in The Elder Scrolls III, the province of Cyrodiil in The Elder Scrolls IV and Skyrim in The Elder Scrolls V. Although admittedly the “Dragonborn” expansion released for Skyrim did let players travel to Morrowind, though. Regarding Morrowind, Elder Scrolls fans will be pleased to know that this is one of the regions which form part of the “Beyond Skyrim” mod. The Beyond Skyrim mod extends Skyrim’s map to encompass new regions, including Cyrodiil (the setting of the Oblivion game) and, of course, Morrowind itself. Actually, the team working on the Morrowind part of the mod recently released an announcement trailer, which shows off their progress so far (see below). This new trailer for Beyond Skyrim shows “The New North”, a region comprising Morrowind’s northern islands. This admittedly does look very good, and for sure makes me want to dive into Beyond Skyrim when it’s complete. 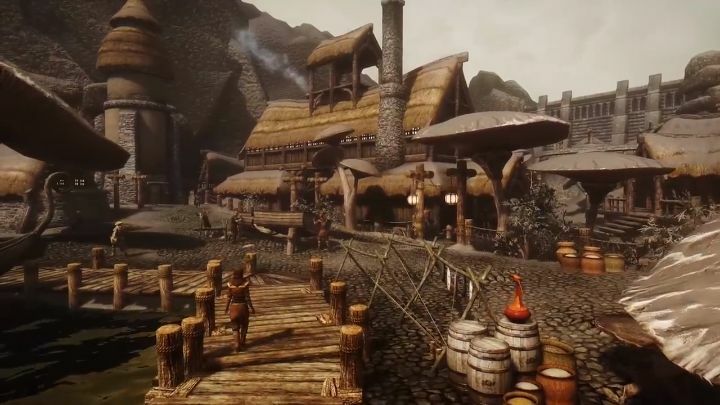 How long this will take is another matter, especially taking into account Beyond Skyrim’s scope and ambition, but it’s likely the people behind the mod will be able to do this before the next Elder Scrolls (part 6) comes out. This is because Bethesda’s game is not expected until at least 2020, as it will likely be a next-gen game made for upcoming consoles like the PS5. If you can’t wait for Beyond Skyrim though, you can also keep an eye on rival project Skywind. This doesn’t attempt to recreate the entirety of Tamriel, but rather focuses on Morrowind, and is also likely to be a great overhaul mod when it’s released in the future.